Howlin' Wolf Records: SIX STRINGS: Howlin' Wolf Records Releases: AVAILABLE NOW! 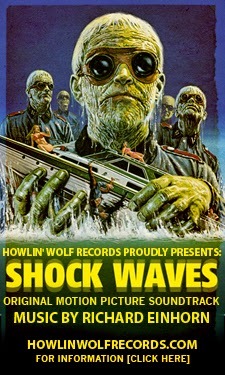 Shock Waves : proved to be a film of several firsts. It was the first of the "Nazi zombie" films which has entered and stayed in the pop-culture mainstream, firmly establishing itself as a fan favorite since its premiere. It opened up the territory for other Nazi zombie pictures , including Zombie Lake (1981), The Treasure of the Living Dead (1982, also known as Oasis of the Zombies), Hard Rock Zombies (1985), Horrors of War (2006, aka Zombies of War), Outpost (2008) and Dead Snow (2009), not to forget the highly-popular manga and its spin-off anime, Hellsing (1997-2009). First feature for director Ken Wiederhorn, as well as composer Richard Einhorn. Wiederhorn's thesis film at Columbia University, Manhattan Melody (1973), had previously won the Student Academy Award for Best Dramatic Film in its inaugural year. Shot on a shoestring budget, with the gracious participation of two film heavyweights in Peter Cushing and John Carradine, It proved that one didn't over-the-top effects or technical perfection to create a movie of chilling psychological horror. 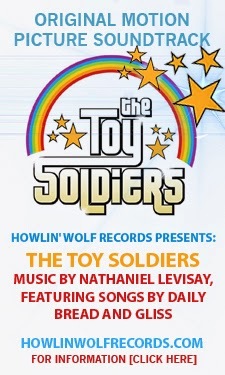 The Toy Soldiers : Written/Directed by Erik Peter Carlson Starring Constance Brenneman, Chandler Rylko, Najarra Townsend, Jeanette May, Nick Frangione, Samuel Nolan, Thatcher Robinson, Megan Hensley, Andre Myers, Izzy Pollak, Kevin Pinassi and Amelia Haberman. Just Announced! For more information on these two releases, please visit "HOWLIN' WOLF RECORDS". One is a classic horror film "SHOCK WAVES" released in 1977 and the other is "THE TOY SOLDIERS" a current film. I think there is a lost of suspense in the newer horror films compare with older ones.